Well, isn't this timely. Conduit 2 begins with uncontrollable calamity out at sea on an oil rig. A coincidence, says High Voltage Software, but isn't that what their shadow government would want you to think? Saddled with a year's worth of overwhelming expectations as one of the few first-person shooters for Wii, The Conduit 2 might find itself in a better climate when it makes its winter 2010/2011 release. High Voltage isn't shopping for a publisher this time - the grass-roots evangelism for this title in 2008 was one factor setting such high expectations for it. And while reviews were all over the map, ultimately averaging to a strong "meh." High Voltage figures it has strong tools already in place - multiplayer, the game engine - to take a second strong swing at The Conduit, published by Sega. "It was very polarizing, but we saw the strengths were consistent, the weaknesses were consistent, it's how [the reviews] chose to weight them," said High Voltage producer Josh Olson. "There were no surprises for us [in the reviews.]" The Conduit 2 opens with Agent Ford (you) tumbling out onto deep-sea drilling platform. He's pursued Adams, The Conduit's main antagonist, through a conduit at the conclusion of the first game. We didn't see the opening cinematic. Our viewing was tuned to the easiest version, so the enemies did a lot of standing around as Olson explained features like alternate fire, which is enabled for all weapons. (Ballistic weapons typically have iron sights, the TPC Launcher fires sticky grenades with proximity detonation.) Enemy AI is now weapon and class-specific, so an enemy drone given a shotgun will try to move in close, while one with a sniper will attack from a distance. Olson said at tougher difficulties enemies will use more sophisticated weapons and throw grenades. Other weapons seen: a gravity weapon collects enemy projectiles such as bullets, grenades, absorbs their damage in a shield-like manner and can redirect them back at your foes. In multiplayer, this will definitely require a melee strategy against opponents with them. 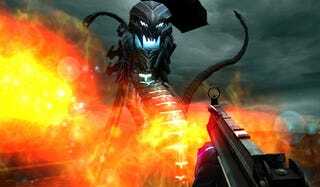 And a phase rifle allows the user to scan through walls and blast opponents there, although opponents will be aware of the scanning and warned to get out of the way. These weapons will be available in both single and multiplayer modes once they're unlocked through an XP system, and loadouts are fully customizable for both modes, which will include "suit upgrades" that function like perks in other shooters. Olson said High Voltage wants to extend replay by giving players a chance to go back to earlier levels with more exotic loadouts on higher difficulties. The boss battle we saw incorporated mounted turrets on the oil rig, put there by High Voltage to give the game less of a repetitive, linear progression, a strong criticism of the first. Other levels down the line will involve riding vehicles and firing from them, and some divergent path choices that take the player out of a room-hall-room-hall progression. Ford also is more talkative in this game; acknowledging the game's Half-Life inspiration, Olson said Ford's taciturn nature in The Conduit didn't allow his personality to come through. The game is MotionPlus enabled but it doesn't enable any core feature, just better control at the edge of the sreen. Multiplayer supports four local, eight online, and there is one cooperative mode, invasion. The studio had considered cooperative campaign but couldn't get enough resources to pull it off effectively. But ultimately, with its first attempt under its belt, and the lessons learned there, and an E3 showcasing more core-appeal titles, The Conduit 2 might find itself in a better climate for this type of game on that type of console. "It's awesome for us that more people are doing stuff like this," Olson said. "There's definitely a market there. All things considered, we did well, Sega's happy, we're happy, and we're making a sequel."